The Congressional Budget Office (CBO) announced that it projects the U.S. federal deficit to surpass $1,000,000,000,000.00 a year starting in 2020. Yes, that is 1 trillion dollars! This annual deficit is adding on to the already-staggering U.S. national debt every year, not to mention the interest that is also accumulating to service that debt. It’s mind-boggling. First, let’s take a look at what the “federal deficit” actually is. Simply, this is the gap between how much the government takes in (i.e. taxes) versus how much it spends (defense, Social Security & unemployment, Medicare, etc.). Unfortunately, when grappling with the deficit and national debt (yes, they are different), you need to throw out the age-old wisdom you were taught on how to balance your checkbook. The U.S. government has spent more than it takes in for quite some time. Just recently-ish, in order to help the U.S. economy push through and out of the 2008 Great Recession, the deficit was driven up $475 billion due to a bank bailout package under the Troubled Asset Relief Program (TARP). As evidenced, government spending can help spur economic growth and move the business cycle out of recession. So, why now is this important to understand? The U.S. is not currently in a recession. In fact, we are enjoying some of the lowest levels in unemployment in history, we are seeing wage growth, inflation is slowing ticking upward, and company earnings are positive. Yet, our deficit is growing sharply. Why? The CBO points to the recent tax reform and increased government spending. Luckily, as history has shown, the U.S. can run on a deficit. Having a large deficit does not mean that there will be an imminent crash in the stock market, it does not mean there will be a rise in foreclosures, and it does not mean you are going to lose your job. 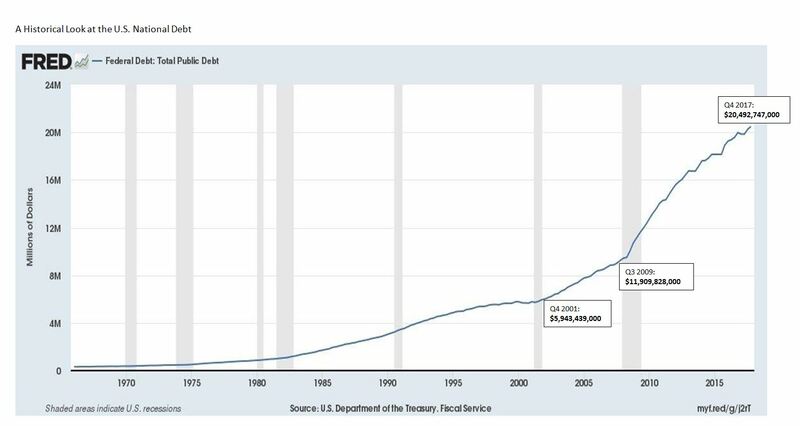 But, as Keith Hall, Director of the CBO said, “The bigger the debt, the bigger the chance of a financial crisis.” Today the U.S National debt stands at today in excess of $21 trillion; and by 2020 it is projected to grow to $28.7 trillion, which is 96% of the U.S’s GDP. The deficit adds to the U.S. national debt – running up our “credit card balance.” It’s adding more fuel to the fire; and among the concerns will be a rapid rise in interest rates, inflation, and the devaluation of the US dollar. In a nutshell, this means you may be paying much more for the cost of goods. In addition, this may make it more difficult for the government to spend its way out of the next recession. Perhaps, rather than spending, the government may be forced to choose the direction of economic austerity – spending cuts and raising taxes. Bottom line, as an investor this is a great reminder to evaluate the risk associated with both your equity and fixed income holdings, and make sure that you are setting yourself up to withstand whatever the future may bring.